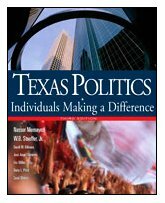 chapters dedicated to criminal justice, education, social services, and the budget. The Third Edition has been thoroughly updated with current data, examples, and topical discussions. Nasser Momayezi is Professor of Political Science and Dean of the College of Arts and Sciences at Texas A&M International University in Laredo. He received his Ph.D. from the University of Texas at Austin. He teaches American Government, Texas Government, and courses on Constitutional Law. The Megastates Ranked by Civic Culture Index Join the Debate: Should we deport illegal immigrants, punish employers who hire them, and seal the border? Constitutions of the Megastates Join the Debate: Should the Constitution of 1876 be revised? Texas in a System of States and Megastates Join the Debate: Should gun control be left to the states rather than to national government? Local Government in Texas Why Have Local Government? Population Changes of Selected Cities in Megastates Join the Debate: Should a city be able to annex an adjacent area without the consent of the residents of that area? Megastate Percentage of Children Under 18 Years Below Poverty Level Join the Debate: Should the Electoral College be abolished? Union Membership in the Megastates and Voter Turnout Join the Debate: Are interest groups beneficial? Party Strength and Gubernatorial Nominations Join the Debate: Should Texas change from a single-member plurality (SMP) voting system to a proportional representation (PR) voting system? Professionalization of State Legislatures in the Megastates Join the Debate: Are you in favor of the 140-day biennial regular legislative session? Megastate Executive Branches: Number of Elected Officials Join the Debate: Should the governor be able to appoint judges instead of having voters elect them? The Texas Court System Judicial Cases in the News The Judicial Process in Texas Contemporary Issues of Tradition and Symbolism "A Jury of One's Peers": Fact or Fiction? Judicial Selection in the Megastates Join the Debate: Should judges be elected or appointed by the governor from a pool of candidates screened by the state bar or another nonpartisan agency? Criminal Justice Policy The Political Character of Criminal Justice Equal Justice for All? Texas Prisons: "Cruel and Unusual Punishment"? How Well Do Incarceration and the Death Penalty Work? Incarceration and Violent Crime Rate Changes, 1991-2001 Join the Debate: Should Texas place a moratorium on death sentences? Texas Health and Human Services What Is Poverty? How Many People Are Poor in Texas? Three-Year Average of Low-Income Uninsured Children in the Megastates, 2003-2005 Join the Debate: Should welfare benefits stay low to increase incentives to work? Average Faculty Salary in Public Universities, 2004-2005 Join the Debate: Should creationism be taught alongside the theory of evolution in school science classes? The Budget Understanding the Budget The Budget-Making Process Appropriations Revenues Evaluating Taxes and Tax Systems Looking to the Future: A Personal Income Tax? The Heavier Tax Burden of the Working Poor in Texas Join the Debate: Do you favor the idea of trickle-down economics?